Is there life in the ProMars? Roland thinks so. Having previewed it at NAMM, Roland has released its latest Plug-Out instrument, an emulation of the ProMars hardware synth. As with other Plug-Out releases, this is compatible with the company's Aira System-1 hardware (which can be used as a controller or to host the instrument) and it can also be used as a standard VST/AU plugin in your DAW. The ProMars monosynth was released in 1979, and this emulation was created using the Analog Circuit Behaviour modelling techniques that were used to fashion the other instruments in the Aira range. It's said to be a "perfect replica", and offers two VCOs plus two sub-oscillators per voice, an LFO, a filter section and an amp envelope. Roland says that the VCOs have increased range settings in comparison to the originals, while the LFO now has a Random waveform setting. There are also reverb and delay effects and a built-in arpeggiator. 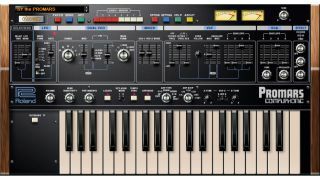 The ProMars Plug-Out synth is available now priced at €110 from the Roland website, though registered System-1 owners can purchase it for a "special price".